London Fashion Week begins tomorrow (14th-18th September) and to celebrate this occasion the fabulous Berkeley hotel (Knightsbridge) has designed an exclusive box of delights that can delivered to your front door! The 'Prêt-à-Portea box' is inspired by the Berkley's incredible fashion afternoon tea; and consists of 10 decedent fashion items (think Christian Louboutin shoe-shaped biscuits with a crisp red iced heel) all contained within a cute handbag shaped take away box. The box is then delivered to your from door in a Vespa adorned in pistachio green and pale pink. 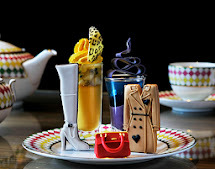 The Berkeley's head pastry chef Mourad Khiat's fashion biscuits are almost as hotly anticipated in London, as Valentino's new collections are in Milan. The dedication to designing the Prêt-à-Portea biscuits is absolute, with Khiat attending London's top fashion events to conjure up inspiration for the new Prêt-à-Portea collection. Fashionista’s can send fellow fashion fans set boxes of 10 biscuits for £25 including delivery to the SW1 area.